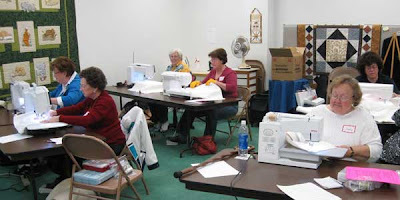 Fiber Antics by Veronica: Free-motion quilting class and "bonus gifts"
Free-motion quilting class and "bonus gifts"
We welcomed beautiful spring-like weather last Saturday for my Free-motion Quilting class. 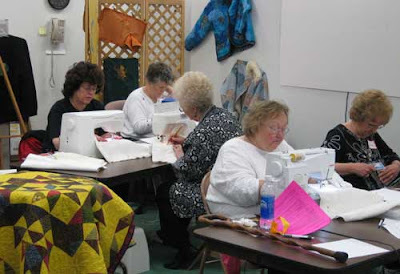 The classroom was full with enthusiastic students and I was excited to be teaching one of my favorite aspects of the quiltmaking process—free-motion quilting. An abbreviated trunk show of my work illustrates thread, fabric and quilting motif choices as well as where I find inspiration for the quilting patterns (a question I am often asked). 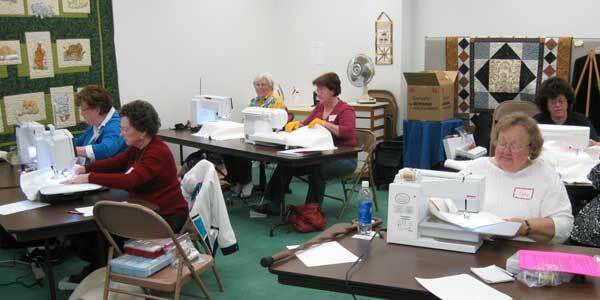 Quilt sizes range from small wall hangings to lap and bed size quilts—all quilted on a domestic sewing machine. One of the things I love about teaching workshops—in addition to meeting so many interesting and creative people—are the "bonuses" that come when people share a bit of their lives and experiences with the class and me. Wanda brought in this quilt top for "show and tell" that she pieced from hand embroidered items made by her grandmother. When completed, it will be a cherished gift for a daughter. The beautifully embroidered pillow cases and dresser scarves "illustrate her exquisite needlework skills," she said. The stitching that is less precise "... shows her determination and strong character" in her later years when physical problems began to set in. What a lovely tribute and a cherished memory. 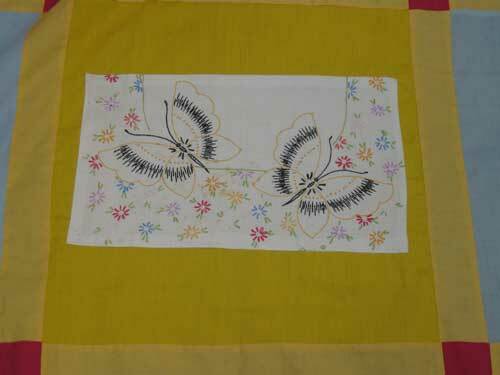 A hand embroidered table linen pieced into a quilt block. 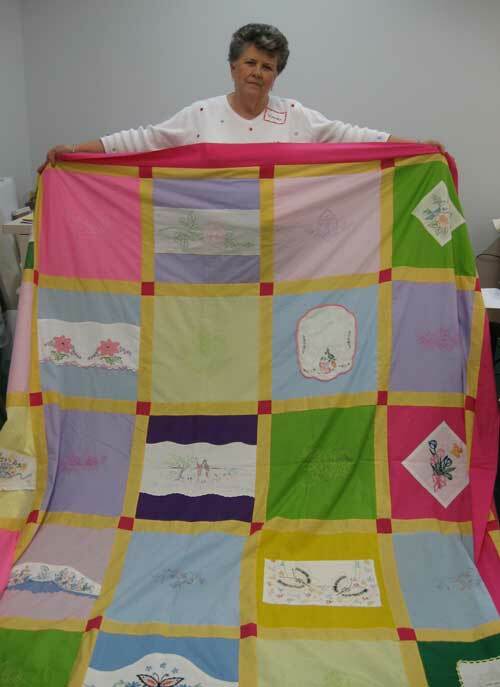 Another attendee, Judy, surprised me when shared the story of seeing the quilted altar cloth I made for my wedding that was entered into a regional quilt show. This was in my early quiltmaking days (we had our 10 year wedding anniversary last year!). It earned a first place ribbon in that show and also appeared in a feature article in PieceWork magazine (Sept/Oct 2003). I am humbled and honored that my work had made such an impression and how sweet and thoughtful she was to relay this memory to the class. I had to dig through the archives to find a photo, but here is the piece to which she referred. 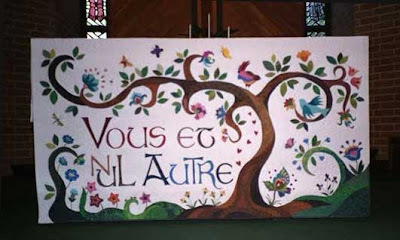 "Vous and nul Autre" ("You and no Other") by Veronica Hofman Ortega. Original design. Hand and machine appliqued. Machine quilted. At the request of our former pastor of St. Jude Church (Chattanooga), Fr. Bob Hofstetter, this art quilt now resides at Good Shepherd Church in Newport, TN. I remember that from St Jude!! That is the most beautiful sentiment and the quilt is lovely. What can you do with rectangles?